Are you looking to sell a Dachshund book and make money in doing so? If so, we are able to sell you our Dachshund books at specially reduced wholesale prices. Buying in bulk – just 5 copies is our minimum order – entitles you to our low trade price. Perhaps you are a breeder, retailer or online eBay seller – it really doesn’t matter, anyone can buy from us as long as you are buying at least five copies. Where can you sell the books? If you are a breeder you could sell or give the book away to your new puppy owners. You could also sell the copies for a profit at Dachshund shows or meet-ups. 5+ books at a price of $10.50 each (includes delivery to you). 10+ books at a price of $9 dollars each (includes delivery to you). 20+ books at a price of $8.50 each (includes delivery to you). 5+ books at a price of £7 each (includes delivery to you). 10+ books at a price of £6 each (includes delivery to you). 20+ books at a price of £5 each (includes delivery to you). What price can you sell it for? Past experience has shown us that some breeders give the book to new owners, some sell the book to new owners and some sell on at shows or meetings with whatever price you wish to set, we do not control that decision. 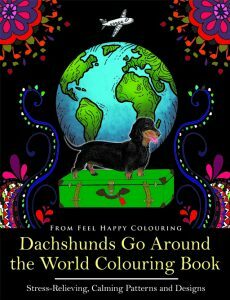 We can tell you that the Dachshund book currently retails on Amazon.com for $12.97 + delivery of $4.98 + applicable sales taxes – that can end up being a total of approximately $19/$20, so there is plenty of margin you can make. 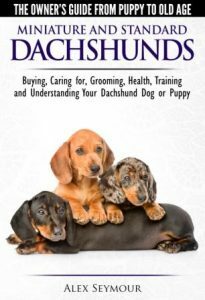 Expert dog whisperer and trainer, Alex Seymour, writes in a fun and entertaining way about Dachshunds while 40 expert breeders were actively involved in making contributions. You will literally find this book packed full of useful quotes giving advice and tips from the world’s top Dachshund breeders. When you buy this book you will also get a free gift from us which are the bonus interviews we conducted with some of the breeders who were involved in the making of this Dachshund book. There just wasn’t space in the main book for these! If you would like to buy in bulk quantity from us, please send an email to our sales department at sales@dogexperts.info so we can give you further information. We are able to ship or deliver anywhere in the world so we can work out an international postage rate if you are not in the USA or UK, we can always price the book in your local currency and take payment via PayPal if for example you are in Canada or Australia.